Swimlanes can be a visually powerful aid to group the roles, departments, systems, or locations involved in a given set of activities. There are certainly appropriate and useful places to use them, but we strongly suggest you don’t simply jump into swimlane mapping without thinking about whether you really need them, or how they are going to be used in the longer term or across diverse audiences. The beauty of Elements is that it’s up to your personal preference or the cultural acceptance of the way processes are documented in your organization. In Elements, you can have both "swimlanes" and "resources on activities". This allows you to draw the flow of activity boxes that is most logical and understandable, with the visual power of swimlanes and the analytical capabilities of resources. There is no limit to the number of swimlanes you can have on a diagram, and they can be horizontal or vertical. The swimlanes are a diagram “background”, so they do not control the positioning of activity boxes and can be switched on or off at will. You can put an activity box anywhere on top of the swimlanes. The placing of an activity box on a swimlane provides a visual cue but does not have any meaning or relationship at a system level within Elements. The resource defines the responsibility for an activity. You can add swimlanes for any diagram. In EDIT mode, (from the right panel) select the SWIMLANES tab. “Show swimlanes” toggles the swimlanes on and off in this diagram. Length is the overall length of all swimlanes. Clicking +/- changes the length. Click ADD to add another swimlane. Click on “title” (in the right panel) to edit the title of the swimlane. In the example swimlane, the titles are “Executive Team” and “Operational Mgmt”. You can control the formatting of the title. You can change the "fill color", and "size" (in the right panel) is the width of the swimlane (horizontal or vertical). Click and drag a swimlane (up or down in the right panel) to change its order. SWITCH FLOW toggles the orientation of the swimlane from vertical to horizontal. There is no doubt that swimlanes can be a visually powerful aid to group the roles, departments, systems or locations involved in a given set of activities, but are also a "double edged" sword. Often, the chosen ‘swimlane’ grouping makes sense for a given project or purpose, but when viewed from a different context, becomes confusing or irrelevant to the visualization of the process. Often people name swimlanes by a department or discipline, and have to write who does what in the activity – or they simply leave out who actually does things, which leaves the process knowledge incomplete. Why use only UPN (not swimlanes)? Instead of constraining process capture into swimlanes, you can add a resource (Human, System, Facility) to the activity itself. 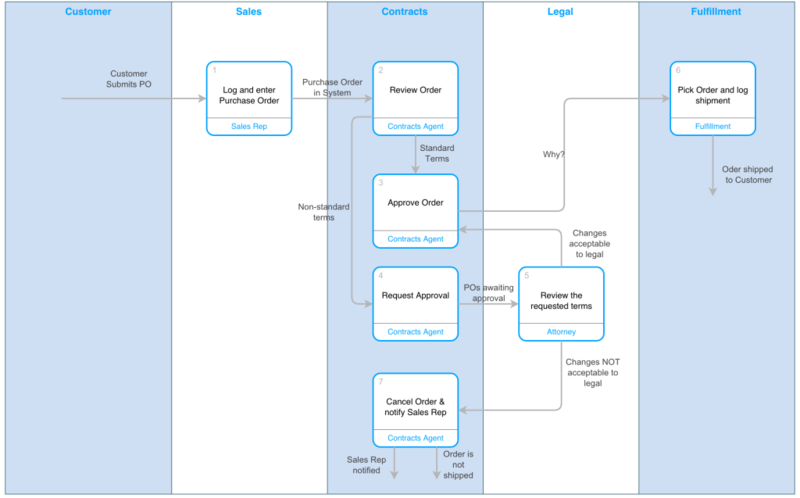 This is the way that over 1000 companies have captured and deployed Process Maps across their orgnizations over the last 20 years with UPN. It allows you to draw the flow of activity boxes that is most logical and understandable. Swimlanes may provide a visual cue, but the more granular association of resources by activity gives you much more power and flexibility. You can add single or multiple resources to an activity box. You can report on resource allocation across your map in order to, for example, highlight all the activities a given resource is involved in, or understand the relationships between activities, roles and the systems or facilities used. Combined with data tables, you can expand the scope and value of those relationships. See data tables and reporting. In Process Knowledge Pro, you will have the ability to add hidden resources to activities, control what is displayed on a diagram, and attribute RASCI (Responsible, Accountable, Supporting, Consulted, Informed) tags by resource. In the Pro version, reporting and working with a RACI or RASCI matrix adds another dimension of power to the knowledge you have captured. 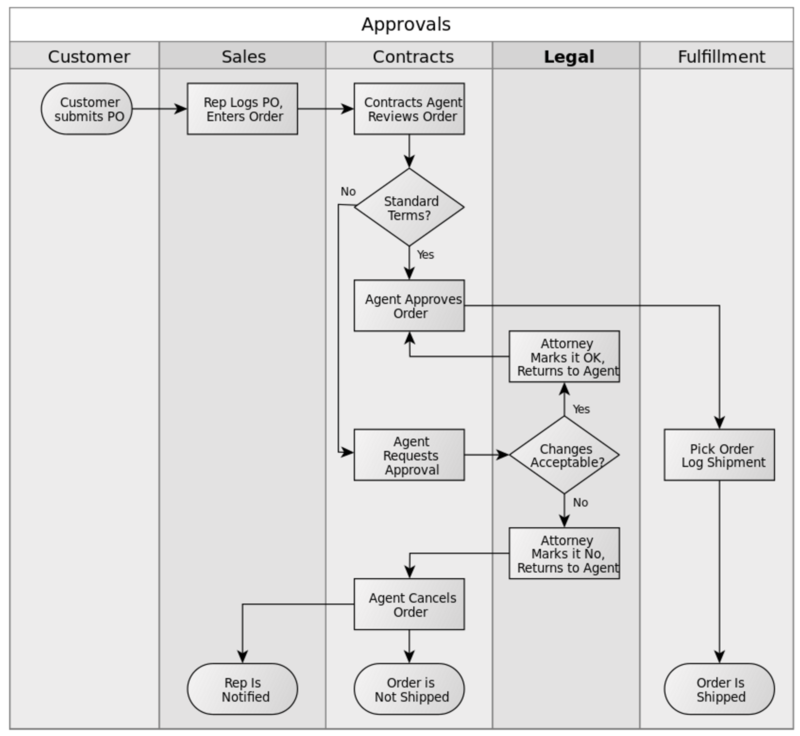 So, we took the swimlane diagram and mapped it using Elements Process Knowledge format; i.e. who does what, when, and why. However, if you really want to have swimlanes (and we agree they can be great for visually showing hand-offs or departmental opportunities for delays/waste), you can combine the two views. Using the swimlane capability described at the top of the page, it is straightforward to get the best of both worlds. However, you can see how much larger it makes the diagram.